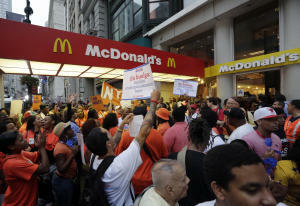 McDonald’s, the nation’s biggest restaurant chain, is, in fact, very profitable. Those $5.5 billion in profits last year came from revenues of $27.6 billion, giving the Golden Arches a profit margin of nearly 20%. The average profit margin of big companies in the S&P 500 index is only 8.7%, according to S&P Capital IQ. McDonald’s has been a perennial overperformer, which makes it an easy target for protesters seeking a bigger slice of the pie. But keep this in mind: Pay at most restaurants is determined by the franchise owner and not the corporate parent, which often owns a very small percentage of the restaurants under their brand. McDonald's, for example, owns just 11% of their restaurants in the U.S., so it may make more sense for the protesters to be picketing local owners rather than focusing their venom on the corporate entity. McDonald’s. 2012 profit: $5.5 billion; profit margin: 19.8%. Brinker International (EAT) (Chili’s, Maggiano’s): $163 million; 5.7%. Half of those companies have a profit margin below the average for the S&P 500. Other chains, such as Ruby Tuesday (RT) and Boston Market, lost money in their latest full year of operations. And if you haven’t driven past a Bennigan’s or TCBY lately, that’s because the restaurant business is notoriously difficult, with chains and individual stores failing all the time. McDonald’s has perhaps 140,000 U.S. employees, which is a small fraction of the 4 million Americans who work at fast-food restaurants. So while McDonald’s might be able to afford a bit more for workers, many industry employees work at chains that could use a little more income themselves. Maybe they should all angle for a job at McDonald’s.